Summary: Turkey’s efforts to curtail press freedom are not serving the state well, even in its fight against terror. Ankara should take steps to improve its record. The state of press freedom in Turkey is a stain on Ankara’s democratic reputation, economic standing, and diplomatic position. Despite domestic and international criticism of the imprisonment and prosecution of journalists in Turkey and of the flawed Turkish legal system, the government has not responded decisively. There are profound political, economic, and ethical reasons for Turkey to improve its record on press freedom. According to independent estimates, Turkey currently has the highest number of imprisoned journalists in the world, but the government and civil society organizations strongly disagree about the exact number. This creates an antagonistic atmosphere that hinders constructive reform. The judicial system tends to equate criticizing government policies and sympathizing with radical ideology. Journalists who report and comment on sensitive investigations or court proceedings as part of their job can face judicial prosecution. Many imprisoned journalists are detained on charges relating to terrorist activities linked to Kurdish separatism. The government filters content online and blocks websites, seemingly targeting content that it deems unwanted or illegal. Large conglomerates control major media outlets, so economic interests cloud media decisions and undermine editors’ and journalists’ ability to provide truly independent, critical reporting. The government directly interferes at times in media affairs by lashing out at journalists or outlets in response to personal and policy criticism. A judicial reform package was adopted in mid-2012 to address some of these issues, but more drastic reforms are needed. A fourth judicial reform package should be adopted soon. End the dispute over the number of imprisoned journalists. The government should reconcile its numbers with its international partners, such as the OSCE and the Council of Europe, and relevant domestic stakeholders. Move ahead with a bold legislative reform process. Ankara must not water down the fourth judicial reform package that could help Turkey meet international press freedom standards. Strengthen civil society’s role. Turkish civil society should increase its internal collaboration and more actively engage the government and international partners on press freedom issues. The Turkish government should recognize civil society’s role as an essential interlocutor in a modern democracy. And European partners must increase their support for key nongovernmental stakeholders. Revive the EU accession process. Working toward EU membership provides an impetus for Turkey’s reforms. The EU and certain member states must overcome their internal disagreements to ensure the revitalization of the accession process. Press freedom in Turkey is one of the core concerns of the country’s civil society and international partners. Beyond any doubt, both internal and international observers believe Turkey’s democratic credentials are tainted by the distinct curtailment of a pluralistic discourse in the country. But that opinion is not necessarily shared by officials at the higher echelons of Turkey’s government. So far, the government’s response to these assessments has been to either deny the problem exists or characterize it differently, arguing that its actions are a response to insulting language or terrorism. While concerns about press freedom in Turkey are not new, the situation has worsened in the past two to three years. Currently, there is no common ground on the definition and description of the problem—or even on its existence. Turkey’s image has suffered deeply as a result. Eight authoritative reports on press freedom were issued in the last two years, and they provide a comprehensive view of the media scene in contemporary Turkey. While the mandates of the organizations conducting the reports differ from one another, the material scope and analytical depth of the reports are impressive. Taken together, they address the full range of press freedom issues: media market, legislative framework, Internet censorship, arrests and judicial prosecution, government interference in the media, and harassment or firing of individual journalists. In addition, the wide variety of authors and the independence of each report enhance the credibility of their conclusions. Some reports are issued by domestic and international civil society organizations, such as the Committee to Protect Journalists (CPJ), Reporters Without Borders,Turkish Economic and Social Studies Foundation (TESEV), and Bianet. Others are issued by governmental organizations, such as the European Union (EU), U.S. State Department, Council of Europe, and Organization for Security and Cooperation in Europe (OSCE)—all of which work closely with the Turkish government on a variety of issues, including pertinent reform projects. These reports all draw on firsthand experience, are informed by an understanding of the state actors’ concerns, and result from a close, long-term relationship between actors in Turkey and the organizations conducting the assessment. Press freedom in Turkey has been deteriorating substantially over the last few years. The picture emerging from these reports is clear: press freedom in Turkey has been deteriorating substantially over the last few years. Although ranking is not necessarily the most significant parameter, it appears that between 2005 and 2011–2012, Turkey dropped by 50 places in the Reporters Without Borders annual Press Freedom Index to 148, two places below the Democratic Republic of the Congo and two places ahead of Afghanistan. Freedom House’s Freedom on the Net 2012, which evaluated the degree of Internet and digital media freedom around the world, ranks Turkey as only partly free and explains that the situation has slightly deteriorated since the first such report was issued in 2009. The 2012 European Commission Progress Report for Turkey, one of an annual series of reports designed to assess what each candidate for EU membership has achieved over the past year, places limitations of press freedom squarely at the heart of its concerns about the country. There are substantive, rational reasons for improving Turkey’s press freedom record, including the country’s need to honor its existing commitments to its citizens and the international community and the impact press freedom deficiencies have on Turkey’s economic and diplomatic position. And there are a number of positive steps the Turkish government and civil society as well as EU institutions could take to move forward. Based on these reports as well as on consultations with Turkish and European analysts, journalists, politicians, government officials (including from the Turkish government), and representatives of international organizations, five issues emerge as the main areas of concern in relation to press freedom in Turkey. Those issues are the imprisonment of journalists and other employees in the media sector, particularly over the Kurdish issue, the legal framework and the judicial system, digital censorship and social media, ownership in the Turkish media market and conflicts of interest, and the government’s direct interference in media affairs. Put in a global context, these numbers are staggering. The CPJ recently asserted that Turkey is the country with the highest number of imprisoned journalists in the world, ahead of Iran and China. While recent reforms allowed for the release of some detainees, the deteriorating trend of media freedom is further confirmed. A closer look at the cases reveals that the imprisonments are not spread across the social or political spectrum and indicates a clear connection to certain issues (see figure 1 for a breakdown). It is clear that the imprisonment of journalists has a distinct Kurdish dimension and is largely based on the anti-terrorism legislation. 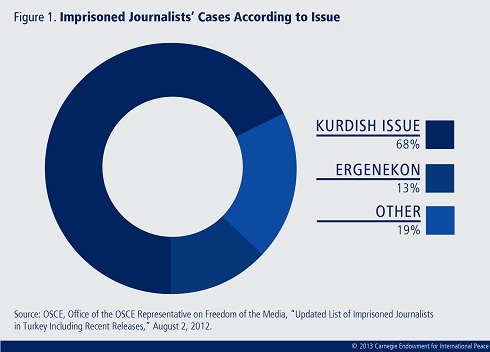 Of the 78 journalists on the August 2012 OSCE list, 53 cases (around 68 percent) are directly related to the Kurdish issue. (The prohibited Kurdistan Workers’ Party or PKK has been conducting violent attacks in Turkey in support of its claims and is listed as a terrorist organization by Turkey, the EU, and the United States.) Another major category consisting of around ten cases (13 percent) of imprisonment relates to the so-called Ergenekon case, which revolves around a clandestine nationalist organization accused of attempting to destabilize the Turkish state. Recent reports have also studied the legal bases for the imprisonment of Turkish journalists. 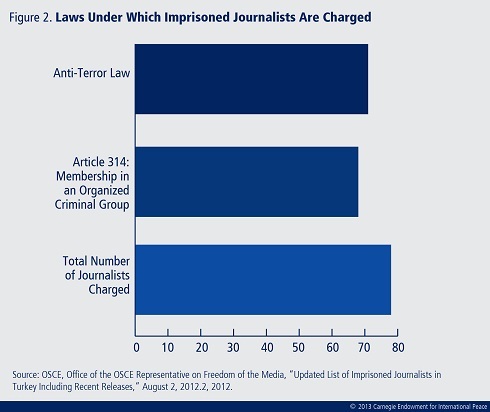 According the OSCE list, 68 of the 78 journalists are charged under the Turkish Criminal Code, Article 314,2 which deals with the crime of “membership of an organized criminal group” (see figure 2). Meanwhile, 71 journalists are charged under the Anti-Terror Law, mainly Articles 5 and 7 (see the appendix for main provisions of this law).3 A majority of journalists are charged under several legal provisions. The European Commission recently stressed in its Progress Report that these legal provisions as well as their openness to prosecutorial and judicial abuse are major causes of concern with regard to press freedom in Turkey. These observations and criticisms are echoed by the Council of Europe Commissioner for Human Rights,4 the United Nations Human Rights Committee,5 and the Committee to Protect Journalists,6 just to name the latest. Most prosecutions are related to leading, creating propaganda for, or being a member of a terrorist organization or its press committee. The majority of journalists imprisoned are charged in relation to the KCK case. The Kurdistan Communities Union (KCK) is a pan-Kurdish political umbrella group linked to the PKK. In spite of wide condemnation of the imprisonments, the Turkish government clearly repudiates the criticisms. For instance, in its August 2012 reply to issues raised by the United Nations Human Rights Committee,7 the Turkish government stated that an earlier OSCE report of April 2012 confirmed that the journalists are not in prison for their journalistic activities. At the core of the disagreement between the Turkish government and its internal and external critics is the issue of what activities are considered journalism and what activities fall, for example, under the scope of aiding and abetting propaganda for, or being a member of, a terrorist organization. Moreover, the issue is not whether Turkey has a legitimate right to fight domestic terrorism since most observers would agree Turkey has that right. At issue is the degree to which the government has a duty to accept critical and differentiated journalism that reports both on terrorist activities and on government’s policies in response to them. At issue is the degree to which the government has a duty to accept critical and differentiated journalism that reports both on terrorist activities and on government’s policies in response to them. Turkish and foreign analysts are in unanimous agreement that the application of the Anti-Terror Law, the Turkish Criminal Code, and the Media Law (which allows the government to prosecute and fine media outlets and journalists on broad bases relating, for example, to threats to national security, public decency, and protection against libel) constitutes a key hindrance to press freedom. Criticisms of judicial procedure include a lack of transparency of court proceedings and insufficient observance of defendants’ rights, such as lawyers’ access to case files, the reasonable expedition of trial proceedings, and reasonable pretrial detention time. The judicial system tends to blur the line between the intention to incite, praise, legitimize, or relativize terrorist violence and the expression of an alternative, critical, or even disturbing opinion. The European Commission recently underlined that in Turkey, “writing an article or making a speech can still lead to a court case and a long prison sentence for membership or leadership of a terrorist organisation.”10 The CPJ, the Council of Europe, Freedom House, and many other organizations also emphasize the issue. The openness of the provisions to far-reaching interpretations that are not in line with international human rights instruments and relevant case law fails to set clear boundaries for the work of the judiciary. Prosecutors reportedly often neglect to take into account the necessary context and intent when assessing publications or statements by journalists. A core criticism in recent reports is the tendency to equate press articles stating a terrorist organization’s aims with the author’s membership in or even leadership of such an organization. A multitude of cases against journalists is also triggered by provisions relating to the administration of judicial proceedings, namely the protection of the confidentiality of investigations and the crime of attempting to influence prosecutors, judges, courts, or witnesses. Journalists who report and comment on the investigations or court proceedings as part of their job of reporting on subjects of public interest can face judicial prosecutions themselves. Qualifications in these provisions that would limit the possibility that journalists could face judicial consequences in cases where reporting is likely to influence, harm, or prejudice proceedings are nonexistent. This results in the excessive use of those provisions against journalists without guaranteeing them sufficient protections in their journalistic work. This issue is further aggravated by conditions surrounding the administration of justice. A judicial reform package was adopted in mid-2012 to address these issues. For example, the reforms transferred jurisdiction over cases involving serious criminal offenses (including terrorism) to specialized regional courts to replace specially authorized courts that were sources of widespread criticism. They also improved the procedural rights of the defendants by, for example, requiring the judiciary to document in more detail its decisions relating to the suspicion of an offense committed and the bases for and proportionality of arrests. The Turkish Ministry of Justice is intensely cooperating with the Council of Europe on legislative reform and programs for the practical implementation of those reforms. Based on European Court of Human Rights case law, Turkey and the Council of Europe embarked on an extensive analysis of relevant legislation as well as a training program for judges and prosecutors meant to address these issues. Because of frustrations with the Turkish judicial system, Turkish plaintiffs regularly turn to the European Court of Human Rights, which in turn produces a huge backlog of cases before that court. Turkey, in cooperation with the Council of Europe, aims to establish a conciliation committee in order to retroactively provide an effective domestic remedy for cases pending in Strasbourg. The corresponding law is pending before parliament. Similarly, the possibility of introducing individual complaints to the Turkish Constitutional Court is intended to deal with cases emerging since October 2012. The issue of Internet censorship stirred wide public protests in Turkey. Different reports elucidate the Turkish authorities’ attempts to regulate this new sector of activity in which cultural, social, and religious sensitivities abound. Tellingly, the OSCE stated that “Turkey provides the broadest legal measures for blocking access to websites by specifying eleven different content-related crimes, but does not reveal the number of websites blocked.”12 Freedom House ranks Turkey’s Internet situation as only partly free, while the European Commission calls the website bans “disproportionate.” The Council of Europe Commissioner for Human Rights lists blocking and filtering attempts as “matters of concern,” and Reporters Without Borders placed Turkey on the list of fourteen countries “under surveillance” in its 2012 Enemies of the Internet report. Web content and social media platforms are becoming increasingly important sources of information for the Turkish public. Web content and social media platforms are becoming increasingly important sources of information for the Turkish public. As a report by the Open Society Foundation spells out, the relevance and availability of news websites, especially online platforms of print media, are markedly increasing.13 The consumption of news constitutes one of the most popular online activities. With 47.2 percent of Turks having access to the Internet in their homes and 13.2 percent of the remaining population having access elsewhere, news emerging in the digital realm has the potential to reach over 60 percent of Turks.14 Online news is increasingly an alternative to traditional news sources, with 72.5 percent of Internet users in Turkey reading or downloading online news, newspapers, or newsmagazines.15 Hence, censorship or other impairments of media freedom in the digital domain and the violation of user rights are relevant to Turkey’s pluralistic credentials. The regulatory framework that provides the legal foundations for these curtailments of Internet and digital media freedom was built up between 2007 and 2011 and has the Internet Law (Law No. 5651) at its center. As with offline media, the Turkish Criminal Code and the Anti-Terror Law are sources of journalistic limits and constraints. These impediments to Internet freedom encompass measures that limit access or content and violate user rights. While there are several limitations on access to and the provision of Internet services, the most severe constraining factors for online media and Internet freedom emerge in the form of content filtering and website blocking. The government justifies these steps by citing the necessity, for example, to protect children or public health, but it seems that content that is deemed by the government to be unwanted or illegal is targeted. The government put in place an adapted version that requires Turkish Internet service providers to offer their customers the possibility to opt into such a system. The criteria that the government uses to determine which websites should be censored, however, are not entirely clear to the public, and the working methods of the committee administering the database of filtered websites are equally elusive. Beyond the sphere of the private user, the government requires massuse providers such as Internet cafes to apply a filtering system. The blocking of websites is also widespread. The Internet Law specifies that it is possible to block a website when there is “sufficient suspicion” that certain crimes are committed. The various grounds for blocking are incitement/ encouragement to commit suicide, sexual exploitation of children, facilitating the use of drugs or stimulants, provision of substances dangerous to health, obscenity, prostitution, providing the location and means for gambling, and offenses under the Law on Crimes Against Atatürk. The vagueness of terms such as “obscenity” as well as concepts such as “sufficient suspicion” raises serious concerns with regard to the necessary clarity and definitiveness of the criteria used to judge which sites should be blocked and the potential for abusing those criteria. In the absence of official statistics, Engelli Web, which lists blocked websites, puts the number currently blocked in Turkey at over 22,000, 85 percent of which are blocked by administrative order (see figure 3). While the Internet Law explicitly makes it possible to block content, other sources of law provide for additional, though not necessarily legal or legitimate, grounds for censorship through the denial of access. These grounds often resemble the charges used to imprison journalists, such as disseminating propaganda for a terrorist organization, and access to websites can be subject to the very wide interpretation of the Anti-Terror Law and the Criminal Code. In the absence of official numbers, the extent of access denied under these headings is not known. There are two problematic aspects of these activities. First, the Internet Law regulates the reasons for blocking websites but those reasons do not include making propaganda for a terrorist organization. Still, websites are indeed blocked for that reason. Legally speaking, this violates the principle of superiority of the law governing the specific matter (blocking of websites) over the general matter (terrorism). Second, the simultaneous, or rather alternative, application of the Internet Law and Anti-Terror Law for blocking websites, as well as the connected administrative procedures for issuing blocking orders, creates an environment of legal insecurity and allows for prosecutorial uncertainty. A media sector must be independent from politics if it is to fulfill its information-dissemination and watchdog functions. The influence of political actors, especially those in the government, in indirect ways—for instance, through economic and financial favoritism or punishment—can undermine the economic and therefore political independence of journalism. A media sector must be independent from politics if it is to fulfill its information-dissemination and watchdog functions. In 2011, the Commissioner for Human Rights of the Council of Europe described the Turkish issue as stemming from large conglomerates’ ownership of media entities in Turkey, something the European Commission’s 2012 Progress Report and the U.S. State Department’s 2011 Human Rights Report also noted as undermining media independence. With the major media outlets belonging to such conglomerates, they become part of economic calculations that also include vested interests in sectors such as construction, energy, finance, distribution, and tourism. This applies to a large number of both pro-government and opposition media outlets. A 2012 TESEV study of the media market in Turkey extensively analyzes this dimension of press freedom.18 Describing the transforming characteristics of the media market in recent decades, TESEV argues that the transition from family-owned media companies to multisector actors was triggered by economic liberalization policies in the 1980s. In the 1990s, the media market, through horizontal and vertical mergers, became dominated by a limited number of corporations that evolved into political actors that are in a “client” relationship with politicians. In a subsequent step, the economic crisis of 2000–2001 caused another restructuring of the sector, bringing the state back as a major media owner. At the same time, the state reacted by setting up regulatory authorities. More recently, corporations with limited or no experience in media entered the scene by buying print, radio, and television outlets. A media sector that is defined by corporations’ drive to maximize profits in other sectors is bound to face major difficulties in fulfilling its essential role of checking and balancing the government. The dependence of businesses on favorable relations with the state undermines the editors’ and journalists’ ability to provide truly independent, critical reporting. Traditionally weak trade unions, a significant unemployment rate in the profession, and ideological divisions further aggravate the situation. A less formal but equally criticized way to curtail the freedom of the press is the interference of the government, at various levels, in the internal affairs of the journalistic profession as well as the increased tendency to directly lash out at journalists or outlets in response to personal as well as policy criticism. In addition to such judicial cases, influence also manifests itself in publiccriticism of specific journalists who in turn get sidelined or laid off by their employers, who fear damage to their interests in the framework of broader economic activities or a direct response through alternative channels. For example, the 2009 tax evasion case against the Doğan Group, which then owned a number of media outlets critical of the government, led to an extraordinary fine of $2.5 billion, which forced the group to sell portions of its media assets. The government also at times influences the editors and owners of media companies, for instance calling on the media not to cover the Kurdish conflict and to discipline journalists who did. The necessity of such tolerance in turn makes direct interference with journalists and media legally questionable and stresses that such interference undermines one of the key components of a democratic society: an independent and critical press. In a recent case, the European Court of Human Rights not only overturned Turkish courts’ verdicts and fines but also went on to state that“the amount of compensation which the applicant was ordered to pay, together with the publishing company, was significant and that such sums could deter others from criticizing public officials and limit the free flow of information and ideas.” The Prime Minister’s lawyer described the outcome of the repeated cases against journalists as having a “deterrent” effect, explaining that “the wording of columnists has noticeably changed especially since the year 2003. Reporters and columnists do not exceed the dose when making criticisms anymore; insulting comments or columns have been reduced to minimum.”21 This statement seems to illustrate the government’s intention to establish a line that journalists should not cross if they want to avoid judicial prosecution. Taken together, the picture is not just bleak, it is strongly convergent. The Council of Europe’s former human rights commissioner described these developments as cumulatively having “a chilling effect” on press freedom in Turkey. Hesitancy and self-censorship have become common features, as documented in a 2011 survey of journalists. These practices have undermined the “advanced democracy” that the government is proclaiming exists in Turkey. Whether this bleak situation is the consequence of extended dominance by one political party or of individual behaviors, it remains certain that the country, its citizens, and its leadership are hurt. Given the troubled security context in which Turkey currently operates both domestically and internationally, it would be rather easy to forget about press freedom. One could claim that there are more pressing issues and that politics is about prioritizing. However, there are strong arguments to the contrary. Press freedom does matter at all times, and it matters for several important reasons domestically, including for managing diversity, handling the Kurdish issue, ensuring the existence of a vibrant civil society, and acknowledging the development of the Internet and social media, and internationally because of economic considerations as well as Turkey’s relations with its partners and influence in the world. Press freedom is an important component of Turkey’s existing commitments to its citizens, the European Union, and the Council of Europe. On several occasions, the Turkish government has advocated for more freedom of the press as part of its drive toward what it has termed “advanced democracy.” It has also explicitly pledged to accept criticism, which implies being open to change in the realm of press freedom. The country has indeed already begun substantive work to amend the three pieces of legislation or regulation that are considered the main reasons for restrictions on press freedom in Turkey: the Media Law, the Anti-Terror Law, and the Turkish Criminal Code. As part of Turkey’s EU accession process, the government has made commitments to abide by the EU’s political criteria and has discussed the avenues for improvement extensively with the European Commission and European Parliament. The work that the Turkish Ministry of Justice has undertaken is considered by EU institutions and the Council of Europe to be serious and substantive. However, at the time of writing, the only development on this front was the announcement by the justice minister and a vice prime minister of the government’s forthcoming adoption of the so-called fourth judicial reform package to be followed by the package’s submission to parliament. Further progress in this area could send an important signal to the EU and the world. The early adoption and implementation of a wide-ranging package would strongly signal that Turkey is determined to move the legal and regulatory environment of its media closer to EU standards. This issue is also key to the country’s economic performance. Despite a strong growth record for nine of the past ten years, Turkey is still lagging behind the BRIC countries (Brazil, Russia, India, and China) in terms of foreign direct investment (FDI), technology, and innovation.22 Turkey continues to depend heavily on capital inflows to continue on the path it has set for itself. Yet, Turkey’s press freedom problems take a toll on the country’s attractiveness as an investment destination. Contrary to a widespread belief in Turkey, this is not a zero-cost situation for the government. The loss of credibility resulting from insufficient press freedom results in a direct cost on the economic front. Investors, banks, and rating agencies—which are crucial in bringing Turkey the FDI that is indispensable for its future development—look negatively at adverse developments in the area of press freedom. Similarly, Turkey continuously faces criticism from its international partners (such as the United States, EU, Council of Europe, OSCE, and United Nations) as a result of its press freedom issues at a time when the government is trying to acquire a new, higher status in world affairs. A defining feature of Turkey has long been the overwhelming power of the state and its various administrative bodies. This situation has evolved drastically in recent decades, and state institutions have begun to shift from being the ever-present operator to being a regulator. Although it is less visible than the modernization of infrastructure or an increase in per capita income, this process of transformation has been fundamental. During the past few decades, Turkish society has also modernized at an accelerated pace. As in the rest of Europe, mentalities have evolved and methods of communication have taken a leap forward. If statistics are even remotely true, Turkey has fully entered the digital age. People have acquired the means to produce, circulate, and access information autonomously. Attempting to control these exchanges is not realistic. Out of a total population of 74 million, 65 million mobile phones are in use, 44 million citizens enjoy access to online news at home or in Internet cafes, and 31.8 million have active Facebook accounts. In addition, nearly 17 percent of those above fifteen years of age have visited Twitter (the eighth-highest rate of use globally).23 This means that, on a daily basis and beyond the limits of any conceivable control system, several million messages are exchanged directly between citizens. In other words, people have acquired the means to produce, circulate, and access information autonomously. Attempting to control these exchanges is not realistic, as such boundaries can be bypassed by sophisticated citizens and modern technology. As a consequence, authorities in Turkey will witness drastic limits in their ability to impose restrictive policies regarding freedom of information. None of the tools used by the authorities—attacking journalists, influencing media owners and editors in chief, labeling dissent as terrorism, assimilating dissent with insult—can prevent information from circulating among citizens. Yet, press freedom is more than citizens exchanging tidbits of information on social media. It is primarily about professional journalists feeding an informed and robust debate with their inquiries and opinions. A modern Turkey needs a robust media, both for internal reasons and for its democratic image in the world. It is time for the authorities to recognize this reality and find the way forward toward improving press freedom. Despite a performing electoral system, Turkey’s democratic image worldwide has been deteriorating to the point that, as far as press freedom goes, the country is regularly compared to China, Iran, and Russia. This comparison is hurting the concept of “advanced democracy” promoted by the Turkish government. Press freedom shortcomings have become a stain on Turkey’s democratic credentials. Plain denial of these shortcomings by the government is not helping to find a way out of the current problematic situation. The Turkish paradox in terms of press freedom is that, while there is more debate than a few years ago, it takes place only at the margins of society. A few journalists raise tough issues at grave personal risk and end up being ostracized from society. Although the government is repeatedly advocating for a pluralistic society, a minimum consensus on how to organize a pluralistic debate is still missing, and opposition journalists are being harassed and arrested. There is more debate at the margins of society but less dissent and less pluralism in the mainstream. A pluralistic society should by definition make room for difference and dissent on the political, economic, societal, and cultural issues at hand. No political party should have a monopoly on truth or wisdom nor impose its own choices on the entire society. No political party should have a monopoly on truth or wisdom nor impose its own choices on the entire society. Turkey is indeed a society with multiple points of view, with different lifestyles emanating from different strands of the population. This diversity makes Turkey valuable on the world scene, and it should be preserved through uninhibited and open debate. The ballot box cannot by itself produce this kind of debate. Civil society should provoke such debates through academia, culture, research, and the media. In addition, the political circles should entertain a robust dialogue with these civil society circles and accept that, in a modern democracy, civil society represents the people’s voices just as members of parliaments do. This issue has long been studied and theorized, but it has recently taken on a more striking dimension with the development of Internet and social media. Political statements acknowledging diversity in the society have so far not resulted in a truly open debate on the ways and means to organize coexistence and tolerance in Turkey. Individually and collectively, the government, the parliament, and civil society organizations have so far not managed to produce a more harmonious society. This is now the challenge that Turkish politicians and society collectively face. Turkey will not be recognized as a full member of the first league of the world’s democratic nations by merely letting one segment of its society “take revenge” on another segment. On the contrary, it will be recognized as such if it establishes an environment conducive to pluralistic debate. Press freedom is crucial to the viability of such an environment. One of the main problems when tackling the issues at hand is the existence of conflicting versions of reality coming from the Turkish government and from many international and nongovernmental sources. Based on the analysis of a host of recent reports that assess different aspects such as the legislative, political, and economic determinants of press freedom in Turkey, the government seems to be stumbling on two choices. The first choice is between continuing to justify press freedom restrictions as a response to terrorism and pursuing a liberal reform process aimed at creating a fully pluralistic democracy. The second choice is between continuing to create a chilling atmosphere around journalistic freedom (something deemed necessary to counter not only “terrorist propaganda” but also “insults”) and allowing for a truly critical assessment of all parts of public life, including actions of individual political figures and government policies. There are several steps Turkey should take to move forward and promote progress in the area of press freedom. A continuous source of tension that pits different stakeholders against one another is the discourse on the number of journalists imprisoned in Turkey for their journalistic work. The latest example of this controversy revolved around the conclusions of an October 2012 CPJ report. After an individual case analysis, the CPJ concluded that as of August 1, 2012, 61 journalists were imprisoned in direct relation to their publications or journalistic work. The Turkish government responded vigorously, although it also announced it would investigate the list in detail. Further information was made available on December 6, 2012, to the author of this report by the Ministry of Justice regarding forthcoming reforms, and its assessment of the CPJ report. In addition, on December 1, 2012, the CPJ officially revised its assessment to 49 journalists imprisoned in direct relation to their work. The difference is explained by liberations that have occurred between August 1 and December 1, 2012. Since the dispute over the exact number creates an antagonistic atmosphere that prevents constructively addressing the broader issues, an important interim step would be to put to rest the row over numbers without entering into a public debate over individual cases. In order to achieve this, a joint process to reconcile and consolidate the numbers is highly recommended. This would go beyond the mere publication by the government of documents justifying unilaterally the number of imprisoned journalists, as it depoliticizes the issue and builds confidence between domestic stakeholders and international partners. Such an exercise should be based on the existing, extensive cooperation between the Turkish government and representatives of institutions it is a member of, such as the OSCE (through the Representative on Freedom of the Media) or the Council of Europe (through the Commissioner for Human Rights), in order to base the work on mutual confidence. Importantly, this process would in no way prejudice the judiciary’s independence but would allow the institution to formally address a controversy that, in its current form, inhibits the solution of the underlying problems. In the final analysis, these diverging statistical evaluations raise the questions of whether press activities are at the center or at the periphery of the terrorism issue and whether a security situation is better addressed through law enforcement and political dialogue rather than in an indirect way linked to press activities. If such a distinction between internal-security and press-freedom issues is made, then a virtuous circle can be established. Turkey can set up a much clearer legal framework and train judges and prosecutors in cooperation with international partners. That would reinforce an already-regular and frank dialogue with institutions of which Turkey as a member (the Council of Europe and the OSCE) and initiate a results-oriented dialogue with the European Commission and the European Parliament. The analysis of the various dimensions surrounding the issue of press freedom already strongly suggests the need for legislative, and even constitutional, reform. This need does not, however, emerge in a vacuum. Serious reform efforts targeted at the issue of press freedom have been undertaken since late 2011. After a meeting between Council of Europe Secretary General Thorbjorn Jagland and Prime Minister Recep Tayyip Erdoğan in November 2011, a two-pronged process commenced that aimed to comprehensively address the legislative and administrative problems undermining press freedom in Turkey. Several working groups composed of Turkish and Council of Europe officials as well as other stakeholders compared existing Turkish law to Council of Europe standards and the European Court of Human Rights’ case law. This screening exercise was conducted to guide Turkey’s legislative reform work. The work carried out under the Ministry of Justice produced a draft fourth judicial reform package that is currently being reviewed by Turkey’s cabinet. Simultaneously, the Council of Europe and Turkey began training programs for judges and prosecutors to familiarize them with standards, case law, and practices within the legal framework of the European Convention on Human Rights. While the former attempted to address the legislative dimension, the latter complemented the process by trying to overcome some deficiencies in the administration of justice. The continuation of the reform process, especially with regard to the current judicial reform package, is crucial to alleviating some of the core problems the Turkish press sector faces. The current legislative framework governing the fight against terrorism, aspects of the criminal code, and the administration of justice is in direct conflict with the existence of a free media. The reform process recognizes this fact. Therefore, it is considered essential that the government rapidly adopts the proposals of the Ministry of Justice and tables them in the parliament in order to correct some of legal bases that have resulted in insufficient press freedom in Turkey. Faced with increased PKK violence, the Turkish government might be tempted to water down the proposed reforms so as not to limit the tools at its disposal. But it should resist that urge. The legitimate response to violence is not an overly restrictive response to the discourse on the issue. The draft fourth judicial reform package covers more ground than press freedom, and its adoption is obviously a complex political issue. Yet, it is recommended that a bold and decisive step forward (as opposed to a mix of partial measures and a promise of further reforms later) be taken to improve Turkey’s performance on press freedom and its image on the international scene. In all established or nascent democracies, the role of civil society is crucial. Whether or not this is recognized by the government, civil society is now a legitimate force of modernization and democratization. This is valid for Western countries, for Russia or China, for Arab countries in transition, and for Turkey as well. This is a global trend that cannot be halted. Turkish civil society organizations and individuals have played a major role in defending press freedom in the recent past. They have acted at both a collective level to counter limitations to freedom and at an individual level by providing alternative forms of reporting in some instances. Internet and social media have played an important role in that respect. It is recommended that the role of Turkish civil society in advocating for better press freedom be enhanced in three different ways. First, Turkish civil society organizations, while protecting their diversity and specificity, should engage in more debates with each other, with the government, and with international counterparts. Second, the government should display an open attitude toward civil society organizations and accept that they are legitimate interlocutors on press freedom issues. Third, external partners such as the EU should continue and substantially expand the support they provide to civil society organizations dealing with press freedom. In all three areas, more workshops, training, exchanges, joint activities, and networking will help modernize and protect the Turkish media sector in a proactive, collaborative, and flexible manner. Much has been said about Turkey’s stalled process of accession to the EU. This is a wider subject than the scope of this analysis. Yet, reviving Turkey’s accession process to the EU is crucially relevant to press freedom in the country for the simple reason that the process provides the government with a fundamental incentive to make progress. Without an active accession process, the government has no formal texts (such as screening reports, benchmarks, and negotiating positions) on which to base further reforms and is relying on its own autonomous decision to move forward. Equally importantly, the accession process provides civil society with a major reference point and a standard on which to base its own activities. Finally, the accession process makes reforms in Turkey a joint endeavor with the EU. Politically, this is what makes the difference. With the European Commission’s 2012 Progress Report now in discussion in the European Parliament, and with the latter’s own report being prepared for a vote in April 2013, the first half of 2013 is considered the best window of opportunity to try to relaunch the stalled process. The process does not mean guaranteed accession, as meeting the criteria for becoming an EU member is a tall order and the results of negotiations have to be submitted to be ratified by 29 individual parties (and Croatia will soon make 30). In other words, Turkey’s accession is a decision to be made eventually by a large number of decision making bodies, but this is several years down the line. But accession per se is not the most pressing issue today. Instead, what is at stake is the shape that Turkish society will have in a few years based on ongoing reforms and trends, and hence indirectly based on negotiations with the EU. Press freedom is one of the key subjects that will delineate the future nature of Turkey, including the country’s domestic cohesiveness and its relationship with the rest of the world. Press freedom is one of the key subjects that will delineate the future nature of Turkey, including the country’s domestic cohesiveness and its relationship with the rest of the world. The tenets of press freedom in Turkey are therefore of strategic interest not only to Turkish citizens but also for the European Union. The EU needs a prosperous, stable, and democratic Turkey irrespective of whether it is a member, a strategic ally, or a neighbor. More importantly, it needs a Turkey that is at peace with itself and manages coexistence and tolerance between various strands of its society. In reviving the process, the European Council, the European Commission, and the European Parliament have a collective responsibility to show leadership. The specific role of France, which over the past five years has blocked the accession process in different ways, is of particular relevance. Turkey in turn should make decisive progress on a broad range of issues at hand. Now is the time for action. According to a large number of authoritative reports by a wide range of institutions, press freedom in Turkey is moving backward. Governmental efforts to persuade Turkish citizens and the international community to the contrary have not been successful. The issue is therefore whether Turkish authorities will see the political, economic, diplomatic, and ethical rationale necessary to improve the situation. Or, to say it differently, the issue is whether the government will continue to aim for Western standards or will instead choose different standards. Curtailing press freedom is not serving Turkey anymore, even in its fight against terror. A number of precise measures can and should be taken in the very short term in order to end the sterile debate on who is who among the arrested journalists and media employees and to pass a bold and comprehensive fourth judicial reform package. On a wider front, mentalities have to evolve and allow both a deeper implication of civil society organizations in defending press freedom and a government–civil society dialogue on the subject matter. And it is up to the European Union to regain its influence in directing the pace and substance of reforms in the field of fundamental liberties in Turkey by relaunching the accession process, while Turkey should itself resume EU-related reforms. Currently pending reforms, changes in mentalities, improved judicial practices, thorough civil society involvement in the press freedom debate, and a frank dialogue with the EU and other partners and stakeholders will help Turkey evolve toward a society more at peace with itself and more cohesive. It will also increase Turkey’s recognition internationally and help the country become more influential in the region and the world. Despite all the reasons to procrastinate, now is the time for strategic decisions. Note: This report was written by Marc Pierini, with Markus Mayr, on behalf of Carnegie Europe and the Open Society Foundation, Turkey. It solely reflects the views of the author. The author is indebted to the 40 persons with whom he discussed press freedom issues in Turkey: Turkish government ministers and high officials, journalists, civil society representatives, diplomats, members of the European Parliament, EU officials, and high officials from international agencies. The report was finalized on January 7, 2013. Article 1 – Any criminal action conducted by one or more persons belonging to an organisation with the aim of changing the attributes of the Republic as specified in the Constitution, the political, legal, social, secular or economic system, damaging the indivisible unity of the State with its territory and nation, jeopardizing the existence of the Turkish State and the Republic, enfeebling, destroying or seizing the State authority, eliminating basic rights and freedoms, damaging the internal and external security of the State, the public order or general health, is defined as terrorism. Article 2 – Any person, who, being a member of organisations formed to achieve the aims specified under Article 1, in concert with others or individually, commits a crime in furtherance of these aims, or who, even though does not commit the targeted crime, is a member of the organisations, is defined as a terrorist offender. Persons who, not being a member of a terrorist organisation, commit a crime in the name of the organisation, are also considered as terrorist offenders and shall be punished as members of such organisations. Article 3 – Offences defined under articles 302, 307, 309, 311, 312, 313, 314, 315, 320, and paragraph 1 of art. 310 of the Turkish Penal Code dated 26 September 2004, Act Nr. 5237, are terrorist offences. Article 5 – Penalties of imprisonment and judicial fines to be imposed on perpetrators of offences specified under articles 3 and 4 shall be aggravated by one half. Penalties to be determined accordingly may thereby exceed the regular upper limit of the penalty prescribed for that offence for any type of punishment. However, in case of life imprisonment, the sentence shall be transformed to aggravated life imprisonment. If the article defining the offence prescribes that the sentence shall be aggravated when the offence is committed within the framework of activities of a criminal organisation, the sentence will solely be aggravated according to that article. However, the aggravation may not amount to less than two thirds of the penalty. The provisions of this article are not applicable to children. Article 6 – Those who announce or publish that a crime will be committed by terrorist organisations against persons, in a way that makes possible that these persons can be identified, whether or not by specifying their names and identities, or those who disclose or publish the identities of state officials that were assigned in fight against terrorism, or those who mark persons as targets in the same manner shall be punished with imprisonment from one to three years. Those who print or publish declarations or announcements of terrorist organisations shall be punished with imprisonment from one to three years. Those who, in violation of article 14 of this Law, disclose or publish the identities of informants shall be punished with imprisonment from one to three years. If any of the offences indicated in the paragraphs above are committed by means of mass media, editors-in-chief (…)1 who have not participated in the perpetration of the crime shall be punished with a judicial fine from one thousand to fifteen thousand days’ rates. However, the upper limit of this sentence for editors-in-chief is five thousand days’ rates. Publication of periodicals involving public incitement of crimes within the framework of activities of a terrorist organisation, praise of committed crimes or of criminals or the propaganda of a terrorist organisation may be suspended from fifteen days to one month, by the decision of the judge, or, if harm is to be expected due to a delay, by the order of the prosecutor. The prosecutor shall inform the judge of his or her decision within max. 24 hours. In this case, the decision of suspension shall be rendered null and void if it is not approved by the judge within 48 hours. Article 7 – Those who establish, lead, or are a member of a terrorist organisation in order to commit crimes in furtherance of aims specified under article 1 through use of force and violence, by means of coercion, intimidation, suppression or threat, shall be punished according to the provisions of article 314 of the Turkish Penal Code. Persons who organise the activities of the organisation shall be punished as leaders of the organisation. Any person making propaganda for a terrorist organisation shall be punished with imprisonment from one to five years. If this crime is committed through means of mass media, the penalty shall be aggravated by one half. In addition, editors-in-chief (…)2 who have not participated in the perpetration of the crime shall be punished with a judicial fine from one thousand to fifteen thousand days’ rates. If the crimes indicated under paragraph 2 were committed within the buildings, locales, offices or their annexes belonging to associations, foundations, political parties, trade unions or professional organisations or their subsidiaries, within educational institutions, students’ dormitories or their annexes, the penalty under this paragraph shall be doubled. The reference regarding “media owners” was annulled by the Constitutional Court, Decision of 18 June 2009, decision nr. E.:2006/121, K.:2009/90. 1 Joel Simon, “For Turkey, World’s Leading Jailer, a Path Forward,” Committee to Protect Journalists, December 11, 2012, www.cpj.org/blog/2012/12/for-turkey- worlds-leading-jailer-of-the-press-a-pa.php. 3 Law on the Fight Against Terrorism of Turkey, Act. Nr. 3713, (1991, as amended: 1995, 1999, 2003, 2006, 2010). 4 See Administration of Justice and Protection of Human Rights in Turkey, Report by Thomas Hammarberg, Commissioner for Human Rights of the Council of Europe, Following His Visit to Turkey From 10 to 14 October 2011 (Strasbourg: Council of Europe, January 10, 2012). 5 See Concluding Observations on the Initial Report of Turkey Adopted by the Committee at its 106th Session, 15 October to November 2 (advance unedited version), United Nations Human Rights Committee, 2012. 6 See Committee to Protect Journalists (CPJ), Turkey’s Press Freedom in Crisis—The Dark Days of Jailing Journalists and Criminalizing Dissent, Special Report (New York: Committee to Protect Journalists, October 2012). 7 See Consideration of Reports Submitted by State Parties Uunder Article 40 of the Covenant – Turkey, Addendum: Replies From the Government of Turkey to the List of Issues (CCPR/C/ TUR/Q/1) to be taken up in connection with the consideration of its initial report (CCCPR/C/ TUR/1), United Nations Human Rights Committee, August 11, 2012, 34 –35; Committee to Protect Journalists, see above, Annex: Letter of June 29, 2012 from Ambassador Namik Tan to Sandra Mims Rowe. 8 See Gözel and Özer v. Turkey, European Court of Human Rights, Application numbers 43453/04 and 31098/05, Judgment, July 6, 2010. 9 See Handyside v. The United Kingdom, European Court of Human Rights, Application number 5493/72, Judgment, December 7, 1976. 10 Enlargement Strategy and Main Challenges 2012–2013, European Commission, Commission Staff Working Document SWP (2012) 336, October 10, 2012, 22, http://ec.europa.eu/enlargement/pdf/key_documents/2012/package/strategy_paper_2012 _en.pdf. 11 Enlargement Strategy and Main Challenges 2012–2013, 22. 12 Freedom of Expression on the Internet—A Study of Legal provisions and Practices Related to Freedom of Expression, the Free Flow of Information and Media Pluralism on the Internet in OSCE Participating States, OSCE, Office of the Representative on Freedom of the Media, 2012, 25, www.osce.org/fom/80723. 13 See Mapping Digital Media: Turkey, Country Reports: Turkey (Open Society Foundations, March 18, 2012). 14 See “Information and Communication Technology (ICT) Usage Survey on Households and Individuals, 2012,” TurkStat, no. 10880, August 16, 2012, www. turkstat.gov.tr/PreHaberBultenleri.do?id=10880. 16 See Freedom of Expression on the Internet, 28 and Freedom on the Net 2012—A Global Assessment of Internet and Digital Media, Freedom House, September 24, 2012, 4, www. freedomhouse.org/sites/default/files/FOTN%202012%20summary%20of%20 findings.pdf. 17 Ahmet Yilidirim v. Turkey, European Court of Human Rights, Application number 3111/10, Judgment, December 18, 2012, para. 54 (translated by author). 18 Dilek Kurban and Ceren Sözeri, “Caught in the Wheels of Power: The Political, Legal and Economic Constraints on Independent Media and Freedom of the Press in Turkey,” Medıa Studies Series no. 3 (Istanbul: Turkish Economic and Social Studies Foundation [TESEV ], Democratization Programme, June 2012), www.tesev.org.tr/Upload/Publication/0a3511ab-e048-4666-abca-a6618d5d15a8/12301E NGmedya3WEB09_07_12.pdf. 19 Orhan Kemal Cengiz, “Did the Prime Minister Read This Judgment?” Today’s Zaman, May 3, 2012, www.todayszaman.com/columnist-279323-did-the-prime- minister-read-this-judgment.html. 20 Lingens v. Austria, European Court of Human Rights, Judgment, Application no. 9815/82, July 8, 1986, at 47. 21 “PM’s Cases Against Journalists Stanching Criticism, Lawyer Says,” Hürriyet Daily News, October 23, 2012, www.hurriyetdailynews.com/pms-cases-against-journalists-stanching-criticism-lawyer-says.aspx?pageID=238&nID=33059&NewsCat ID=338. 22 FDI inflows in Turkey represent 1.7 percent of GDP, roughly equal to India’s (1.6 percent) and inferior to Russia (2.5 percent), Brazil (2.7 percent) and China (4.1 percent). Source: UNCTAD. 23 “The Netherlands Ranks #1 Worldwide in Penetration for Twitter and Linkedin,” Comscore.com, April 26, 2011, www.comscore.com/Insights/ Press_Releases/2011/4/The_Netherlands_Ranks_number_one_Worldwide_in_ Penetration_for_Twitter_and_LinkedIn.